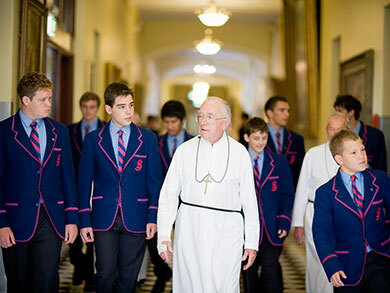 As a Catholic school in the Marist tradition, St Joseph’s College is committed to educating the students in its care to become men who value and nurture their faith long after they leave school. Boys are challenged to appreciate their responsibility to the local and global community through a commitment to the values of social justice and compassion for the needs of others. The College is inspired by the life and vision of St Marcellin Champagnat who, in post-revolutionary France, saw the plight of the poor (particularly those who had no hope of receiving an education), and consequently began the order of Marist Brothers to counter this need. In Australia in 1881 the Marist Brothers founded St Joseph’s College, Hunters Hill, and their presence continues to inspire and inform the life of the community to the present day. At the Crib, where we encounter innocence, simplicity and gentleness and are touched by the situation of poverty and fragility of people, especially the least favoured. At the foot of the Cross, where we find a God who shares the suffering experienced by humanity, and transforms these experiences. We associate ourselves with those who struggle for bread, justice and peace. At the Altar, where we find a privileged place to enter into communion with the Body of Christ: to stand as one with all who are members and to deepen our relationship with the living presence of Jesus in our lives which subsequently leads to a deeper relationship with others. St Marcellin was at once a realist and a visionary and it was in this manner that he instructed the first Brothers in their role as teachers. It is with this same appreciation of the privileged nature of the vocation that teachers at St Joseph’s work with students to ensure an education that is of the highest standards and reflects the Gospel imperative of love of God and others. Staff at St Joseph’s are given opportunities to deepen their appreciation of the Marist Charism through programs such as ‘Sharing our Call’, ‘Schools of the Spirit’ and the ‘Faith Formators Colloqium’ facilitated by the Marist Ministries Office of the Sydney Province. The Family Mass held once a term on a Sunday morning. This is a wonderful celebration and is attended by many local and country families. Wednesday morning Liturgy of the Word – held at 8.25am and available for all students and staff. Friday morning form Masses – held throughout the term enabling each year group to prepare and celebrate the Eucharist. Boys who have not been confirmed are invited to take part in the preparation program offered by the College. The Sacrament of Confirmation is celebrated annually and is a wonderful expression and affirmation of the faith of both those who receive the Sacrament and the entire College family. In conjunction with the liturgical life of the College and the formal Religious Education curriculum, all students take part in experiences to assist them in reflecting on the place of faith in their lives. Students in Years 7 to 10 take part in reflection days which provide an opportunity for them to contemplate God’s role in their lives,deepen their friendships and focus on putting their faith into action. These days are developed in conjunction with the content of the Religious Education curriculum. In Term 1 students in Year 11 participate in a Ministry Day as part of their preparation for the Ministry Week they complete later in the year. During Ministry Week students commit to an extended period of community service where they are challenged to a more adult appreciation of what each of them can do to ‘help the weak to carry their burdens’ (Acts 20:35). This active witness to the message of Jesus and the social teaching of the Catholic Church is a critical component of the senior program at St Joseph’s. The Year 12 Retreat provides students with the opportunity to leave the everyday College routine and engage in a more intensive period of reflection on faith, life and relationships. The small group environment, the interaction with teachers and in particular the opportunity for quiet prayer and sharing at this critical stage of life is an experience that stays with the boys long after the year is over. This program provides Indigenous students from both urban and rural communities with the opportunity of an outstanding education in an environment that is supported by appropriate pastoral care. Parents, carers and families of Indigenous students are warmly welcomed into the College community and are encouraged to actively engage with the school. Liaison with students and families is facilitated through a number of structures including the roles of the indigenous Education Assistant and the Director of Mission. Indigenous students actively contribute to all facets of life at St Joseph’s and regularly take part in community events such as the National Indigenous Leadership Program, local council Reconciliation Day events and NAIDOC Week celebrations. In December each year St Joseph’s hosts the Marist Children’s Camp for children who experience a range of physical and emotional disabilities. The Joeys students who volunteer to lead this program provide living witness to the Christian imperative of service that underpins all life at the College. 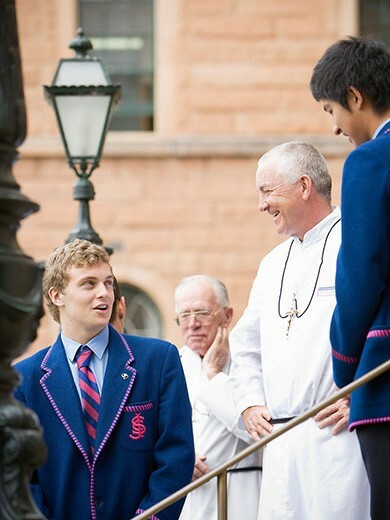 They are extraordinary young men who exemplify the St Joseph’s College motto: ‘Strive for better things’. Staff of the College also give a great deal of their own time throughout the year preparing for the Camp to ensure that the children who visit have a non-stop time of fun and games. Each year senior students have the opportunity to apply to work in a Marist community in a developing country. Since 2008 groups of students have travelled to St Joseph’s School, Mabiri, in Bougainville Papua New Guinea, as part of the College’s service-learning partnership with the disadvantaged school. The opportunity to live and work alongside the Mabiri community has proven a life-changing experience for the boys. St Marcellin Champagnat’s vision was that the students in the schools his Brothers founded would be ‘good Christians and good citizens’. Through spending time with the poorest of the poor, the students of St Joseph’s are prepared to take their place in the global community, aware of the vast differences that separate its citizens and ready to contribute to a more just and equitable society. Throughout the year students, staff and families are offered many opportunities to share their time and resources with the disadvantaged and marginalised. Whether supporting Marist initiatives such as the project in East Timor, Caritas Australia or local organisations such as the Friday evening volunteers program at the Matthew Talbot Hostel, the community of St Joseph’s is exemplified through its spirit of unlimited generosity. When questioned, Jesus told the disciples that he had come, ‘to bring life to the full’. It is our great hope that the opportunities offered to the boys throughout their time at Joeys will assist their understanding of the meaning of this gift for their own lives and its challenge to them to improve the lives of others. 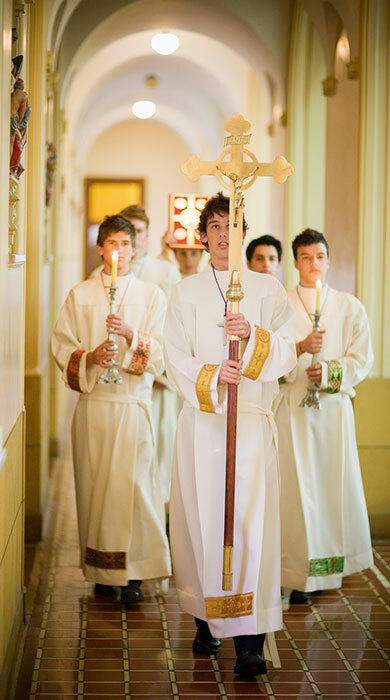 St Joseph’s College is committed to educating the students in its care to become men who value and nurture their faith.